It had been almost two and a half months since I had done any caving at all. Amos covered for me on one scheduled trip and I canceled another because of a back injury that crept up and snatched away my ability to do physical activities without extreme pain. My wife and friends kept asking me, “Are you sure your up to doing this?” To tell you the truth I kept asking myself this question right up to the morning of the trip. I wasn't 100% healed, but enough that a good dose of anti-inflammatory would get me through the day. Andy was going to be with me and that help relieve a lot of my anxiety about this trip. 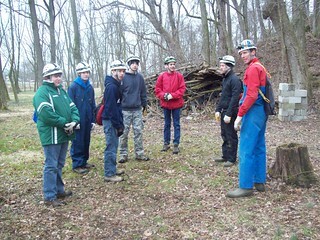 I had stopped by a Troop meeting a few weeks prior to the trip to talk to them about caves and caving. These talks are also one of my favorite activities. There must have been at least 20 boys from all ages of the Troop listening to me talk about spelology and safe caving techniques. I kept thinking, are they all planning on going caving? At the end of the cave talk I talked to the adults and senior Scouts. Maybe 4 or 5 kids met the BSA age limit of at least 14 years old and were going. They thought it would be good for all the boys to hear the cave talk. I couldn't agree more. There were a few kids who were right with me through the whole talk. They answered questions and participated in conversations. They did have a challenge with getting adults from the Troop to go. Since I am a BSA volunteer myself, it was easy just to count me into their required adults going on the trip. Back to the day of the trip I was psyched up to get underground. We met at our favorite McDonald's and carpooled out to the cave. Andy brought a friend of his with him. 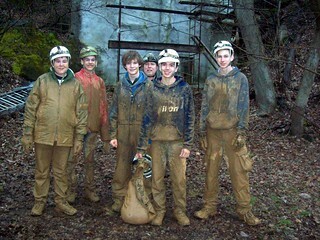 This was Bill's first caving trip. Andy claimed him to be an accomplished rock climber, so I wasn't too worried. Later on I saw how well Bill worked and related to the kids. This was a real pleasant surprise. Not many adults relate with new kids right out the gate, much less with a new adventure sport. One thing I have learned from running trips like these is that people either love caving or hate it. Usually it all depends on their experience on the trip. Each individual's abilities plays into this, too. Looking at the pictures I hope you an get a glimpse of what the outcome of this trip was. Starting with James, I was a little concerned. He was younger and not as athletic as the others. He had a little difficulty with a climb. I thought this was going to discourage him right from the start. I asked him to back track and I would meet him back at the first room and show him the “easier” way that I took (remember I'm still nursing a bad back). The oldest Scout, Austin, jumped up to the plate and offered to go with him so he wasn't doing any passage by himself. This worked out fantastically. The next squeeze Andy and Bill took them through was the “Wishing Well”. Just watch the video to get the point of it. This is where I found out that Jake has a little issue with claustrophobia. Austin, Ben and Daniel went through the squeeze. Jake, James and I took the, sort of, walking passage around to meet them. Andy lead us around a few other climbs and squeezes. We visited the “Catacombs” via the “Chimney” and went “Off the Map” and back again. We wondered over to the “Key Hole” and only James and I bowed out of this, but I was still able to give him a challenge. Check out the video of this one too. We were about two hours and forty five minutes into the trip. My back was getting tired and a couple of the boys were too. We opted to call it a day and head on out to the exit. It was a lot colder outside the cave than inside. The boys granted me the obligatory “muddy” picture and we walked to were we parked the cars. It was just starting to drizzle when we got there. By the time we were in the middle of getting changed it was full blown hail pelting us as tried to get dressed, dry and warm. What a memory maker. We stopped to have dinner on the way home. This is the part where I get to talk to the kids and get some feedback. I just wanted to point out a few observations I had, and what made this such a fun trip for me. Daniel is the younger brother of Alex, who is a valuable member of my crew. This was his first real caving trip. Sorry you didn't make this trip Alex. You would have been proud. He did all the climbs and squeezes his big sister does. Ben, I think, just got a kick out of getting muddy, and it was all OK to do this. His first trip too and he did great. Never lost his sense of humor. He even named a rock feature "Eagle Rock". He explained how he saw the eagle in the feature, now that's stuck in my head forever. James, I thought, was going to be the kid that hated it and never wanted to go caving again. Boy was I wrong. He took every challenge in stride and did progressively better as the day went on. He probably had the most mud on him, but he was very cool with that. One might say proud of his warrior mud painted face. Remember Jake claimed to have issues with claustrophobia? Did you check him coming out of the “Key Hole”? Yup, he's hooked. I wonder what he was telling his friends at school that week? I think Austin thought we were going to be doing some easy walking passages. HA. He had a blast and I'm putting him on my “call list”. Hopefully he'll come out and learn a little about being a cave guide. He'd be good at it. It would be good to have him on my crew. Actually any of these guys have that potential. They accepted the challenges that were presented to them with a smile. They all grew a little more well deserved attitude that day too. Check out the whole photo album of this trip here. You can also see the other videos, "Part 1" and "Part 3".